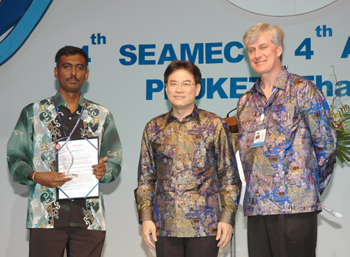 H E Mr Jurin Laksanawisit, SEAMEO Council President and Minister of Education of Thailand; and Mr Jean-Vianney Auclair, Assistant Deputy Minister, Manitoba Education, Citizenship and Youth, Canada, presented the Plaque of Recognition to the 2008 SEAMEO Jasper Research Award Winner, Mr Nantha Kumar Subramaniam, Vice-Dean and Senior Lecturer of Faculty of Information Technology and Multimedia Communication, Open University Malaysia. The 2008 SEAMEO-Jasper Research Theme was "Innovation in Education through ICT". The winning research is titled "Toward Asynchronous Collaborative Learning Pedagogy for Adult Learners in Small Learning Communities: Implementation and what Characteristics that Influence Adult Learners Critical Thinking Ratio". The study demonstrated how ICT use in education will help achieve quality education for all and set an ideal environment for lifelong learning.